Stir things up with our Pizza Man Magnet. A traditional marketing magnet takes a twist with this unique shape. Include your logo, contact info, hours, special, coupon...there is plenty of space to promote your restaurant. 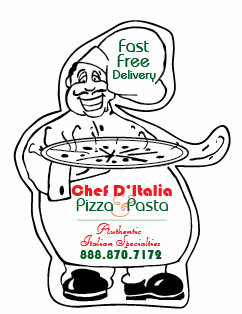 Need some ideas?...have us design something custom and unique that will get your pizzeria noticed.